The Infiniti QX80 is getting a slight refresh for the 2018 model year. This comes after the SUV debuted in 2013 and is welcomed since the SUV segment is so hot these days. The grille, headlights, and hood receive the biggest updates, while new LED taillights, wheel designs, and color options round out the refresh. 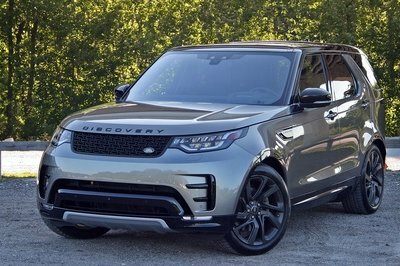 Even milder changes happen inside, though potential customers wanting the latest and greatest will find the larger rear-seat entertainment screens, revised leather-wrapped steering wheel, and larger storage compartments a welcomed addition. The QX80 is somewhat of a niche vehicle. Infiniti says it sold 14,085 QX80s in the U.S. within the last calendar year, which is an 8.3-percent increase over the prior year. Compare that to the Chevrolet Tahoe’s 2016 sales of 103,306 in the U.S. Even the Cadillac Escalade outpaced the QX80 in 2016 with 23,604 examples sold in America. Still, Infiniti says its research shows the QX80 averages the youngest buyer in the full-size SUV segment, with a high percentage being females. The brand also labels the QX80 buyer as “affluent, high-achieving entrepreneurs and business leaders, often with families, who demand space and utility, hand-crafted quality and modern design, and effortless on-road performance” – whatever that means. Basically, the QX80 is a three-row, full-size SUV for those who want to stand out. The changes for 2018 won’t magically boost QX80 sales toward the Tahoe, but Infiniti can surely expect to see growth in the segment. Let’s see exactly what’s changed for 2018. The grille is more upright than before, and the hood is now longer. You’ll have to look closely to spot the differences between the 2017 and 2018 QX80s. Nevertheless, the changes do impart a bolder stance that wasn’t present before. The grille is more upright than before, and the hood is now longer. In fact, the grille moves 3.5 inches more forward, and the hood is raised by 0.79 inches. The new LED headlights are moved further up the front fascia. They also have a more aggressive, more modern canter. Infiniti calls them “human-eye” headlights. They’re said to have a triple light guide that passes through multiple lenses to better disperse the light across the road. Down low, the LED fog lights and the surrounding bodywork have been revised for a sharper look. The front fender vents even have a sharpened shape. Overall, the new front is more aggressive and squarish, which matches the roofline and crisp lines of the D-pillar. The bodywork helps harden the QX80, giving it a more macho stance. That’s something the previous bubbly front design lacked. Three new exterior colors are added. Elsewhere on the outside, the QX80 retains most of its previous sheet metal. That’s fine, though, since the 2018 changes are only a mid-cycle refresh. The rounded wheel openings, the blacked-out roof pillars (minus the stylish D-pillar), and the integrated running boards all remain familiar elements. Infiniti did make those running boards 0.79 inches wider for easier footing. The taillights are new, though. As mentioned, they are now LED units and are far less bubbly. The chrome trim above the license plate now extends into the red lenses, while different section within the taillights have different shades of red. The lower bumper is crisper, as well. New horizontal reflectors help bring definition and better frame the trailer hitch cover. The 2018 QX80 rides on 20- and 22-inch aluminum alloy wheels. The 20s have a six-spoke design, while the 22s have an 18-spoke design. Both wheels are wrapped in wide, 275-series all-season tires. Three new colors are added to the options list – Moonstone White, Mineral Black, and Champagne Quartz – making nine choices in all with solid, metallic and pearl finishes scattered among the hues. As for the seating, three color choices and two leather grades are now offered. Changes to the 2018 QX80’s interior are minimal yet important. A revised steering wheel and gear shifter not only look better but should feel better to the touch. New leather options are added, and the second-row entertainment system moves from 7.0- to 8.0-inch screens and better resolution at 900 x 540 pixels. The hard-key buttons controlling the infotainment system and radio have been reorganized for easier use. As for the seating, three color choices and two leather grades are now offered. There are the standard leather and the optional semi-aniline leather with color-contrasting piping. Colors for both leather options include Saddle Brown, Wheat, and Graphite. Regardless of color, the leather comes with a handsome and plush quilted pattern that really looks high-class. Real wood trim lines the center console, dash, and other areas of the interior. Best of all, Infiniti now uses a new micro-coating on the leather that is resistant to stains and denim dye transfer. Infiniti now uses a new micro-coating on the leather that is resistant to stains and denim dye transfer. 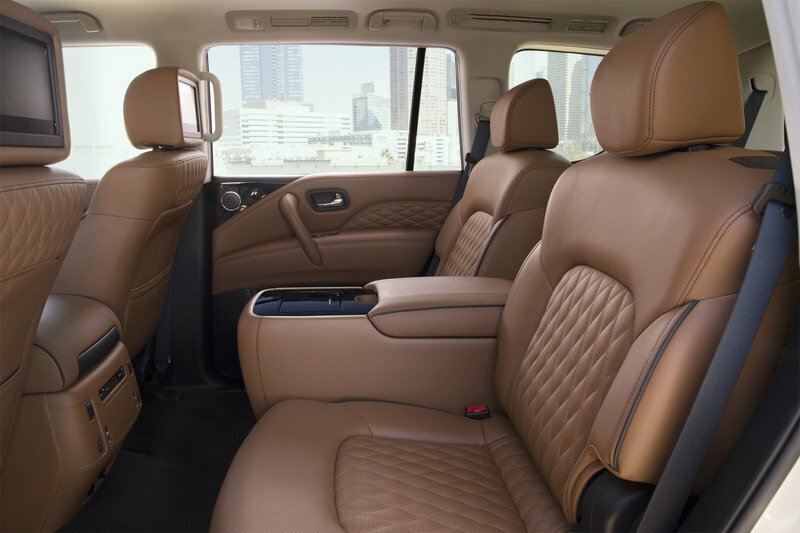 The QX80 continues to offer seating for eight people with the second-row bench or seven people with the second-row captain’s chairs. With those captain’s chairs comes a large center console for storage and cup holders. USB and charge ports are placed on the console between the front seats. Second-row passengers can adjust HVAC settings for rear passengers from here, as well. The outboard seats in the second row are heated. The same is true for the front seats, which also have ventilation. Drivers will appreciate Infiniti finally adding a smart key that automatically adjusts over 200 settings saved to that key fob. For example, dad’s key will have his seat setting, radio presets, and navigation preferences saved, while mom’s key will have all of her stuff. Depending on which key is used depends on what settings are activated upon start-up. With both rear rows folded, the QX80 swallows 95.1 cubic feet of cargo. Smaller yet thoughtful updates include a larger cell phone storage bin that accommodates devices up to 2.9 inches wide. The USB port has been moved to a more accessible spot. The front cup holders now hold two 44-ounce cups for us thirsty Americans. The QX80 adopts Nissan’s Smart Rear View Mirror system for improved rearward visibility. Push a button, and the rear view mirror shows a camera view from the tailgate. This is extremely handy when carrying tall passengers or large cargo. The QX80 remains massively spacious inside. The cargo area has 16.6 cubic feet of room behind the third row and 49.6 cubic feet with the third-row folded flat. With both rear rows folded, the QX80 swallows 95.1 cubic feet of cargo. Front occupants enjoy 39.6 inches of legroom and 39.9 inches of headroom. Second-row passengers get 41 inches of legroom and 40 inches of headroom. Naturally, the third row is more cramped, yet it still offers 28.8 inches of legroom and 36.8 inches of headroom. Shoulder room front/middle/rear (Inches) 63.8/63.5/605. The 5.6-liter V-8 remains and still produces a very respectable 400 horsepower and 413 pound-feet of torque. No changes happen under the 2018 QX80’s hood. The 5.6-liter V-8 remains and still produces a very respectable 400 horsepower and 413 pound-feet of torque. The seven-speed automatic returns, as does the standard rear-wheel drive and optional four-wheel drive system. Those getting the 4WD system will enjoy the Auto mode. It’s a set-it-and-forget-it system that only sends power to the front wheels when the rear wheels lose traction. The 4WD system is also a part-time system, allowing the driver to select 4WD High range and 4WD Low range. High range locks in the front axles and splits power delivery evenly between the front and rear. 4WD Low range does the same but uses shorter gearing to multiply torque for better low-end grunt, which is perfect for hill climbs, churning through deep mud or sand, or recovering a stuck vehicle. The 4WD system also boasts a Snow mode. Though the QX80 does not have locking differentials, it uses its brakes to redirect power to the tires with traction. 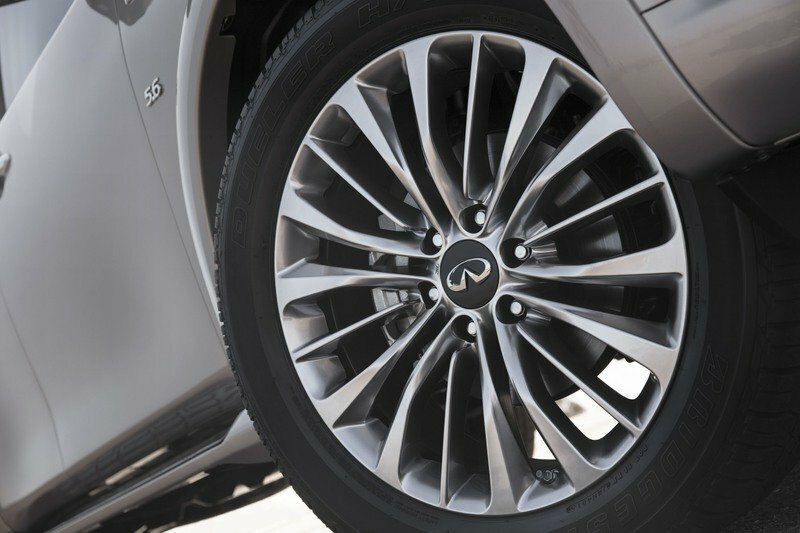 Infiniti calls it the four-wheel Active Brake Limited Slip system. The four-wheel independent suspension uses new dampers with a 30-percent reduction in damping force for a smoother ride over rough pavement. Keeping the QX80 from feeling sloppy is the optional Hydraulic Body Motion Control system, or HBMC. It uses high-pressure hydraulics linked between the shock absorbers to limit the amount of body roll during turns. Coming standard is the automatic rear leveling system, which keeps the tail from sagging when loaded down. 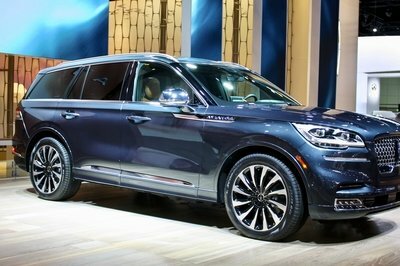 This also helps with the QX80’s 8,500-pound tow rating. And if you haven’t guessed by now, the QX80 rides on a ladder frame shared with the Nissan Armada and its global variant, the Patrol. Fuel economy isn’t the best, though that’s not a surprise to someone dropping big money on a big SUV. It’s also not too far off what other full-size, three-row SUVs achieve during EPA testing. The QX80 in RWD form will get 14 mpg city, 20 mpg highway, and 16 mpg combined. 4WD models get 13mpg city, 19 mpg highway, and 15 mpg combined. And yes, the direct-injected V-8 drinks premium fuel. Infiniti is adding $900 to the QX80’s base price. That means the RWD model now starts at $65,745 and the 4WD model starts at $68,845. 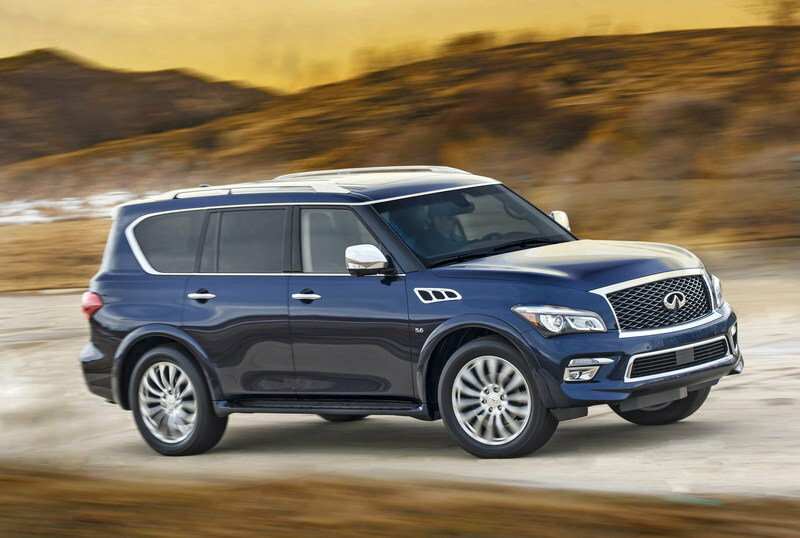 Three trim levels are offered: the standard QX80, the Signature Edition, and the Limited. The Limited starts around $90,000 and will come with just about every optional feature as standard equipment. The venerable Cadillac Escalade has been the choice of automotive extravagance since 1999. 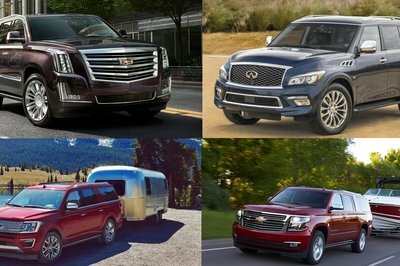 Over the years, its luxury levels have risen, further separating it from its Chevrolet Tahoe and Suburban cousins. 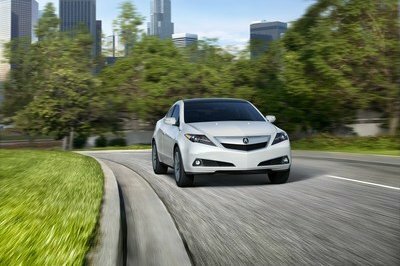 The current ‘Slade debuted for 2015 and remains a fresh and solid choice in this category. It can be had in two wheelbase lengths, but both offer three rows with seating for seven. Power comes from General Motors’ 6.2-liter, LT1-derived V-8. It has direct fuel injection, variable valve timing, and cylinder deactivation and manages an impressive 420 horsepower and 460 pound-feet of torque. An eight-speed automatic transmission does the shifting and the rear wheels receive power. A full-time 4WD system is optional. The EPA estimates fuel economy at 15 mpg city, 22 mpg highway, and 17 mpg combined on 2WD models. Getting 4WD only alters the highway economy, dropping it to 20 mph. 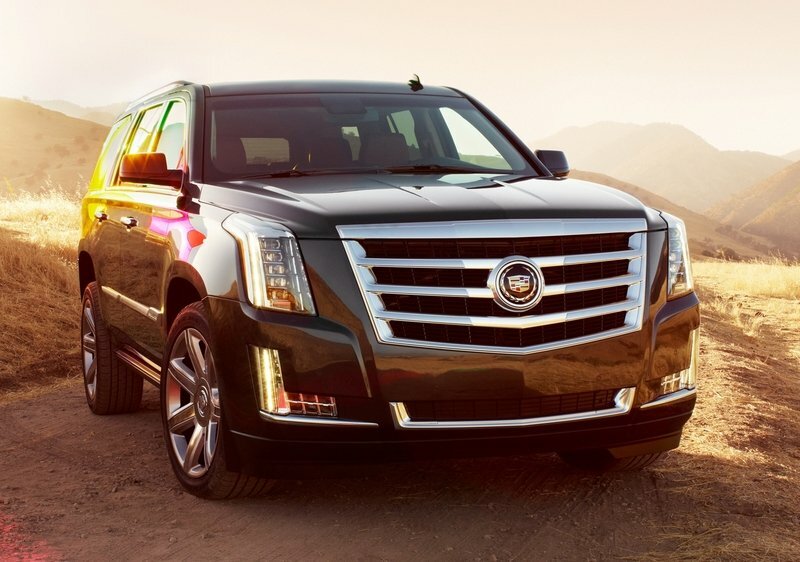 Cadillac keeps the Escalade riding smoothly with GM’s Magnetic Ride Control. The system’s shock absorbers have magnetic particles suspended in the fluid that vary the ride depending on how much electricity they receive. GM says the shocks can adapt to changing road conditions several hundred times a second. The Escalade still uses a solid rear axle but has an independent front suspension. Pricing for the 2017 Escalade starts at $72,090 for the short-wheelbase model. Checking all the option boxes puts the long-wheelbase Escalade ESV Platinum at $99,390. Adding other options adds even more to the price. Read our full review on the 2017 Cadillac Escalade. 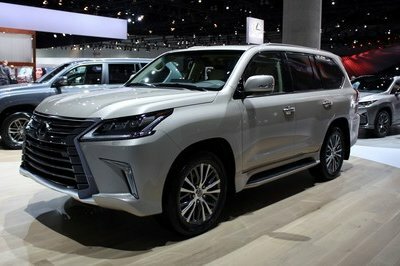 Like the Tahoe-based Escalade and Armada-based QX80, the Lexus LX570 is a dolled-up Toyota Land Cruiser. That’s a great thing for those fond of Toyota’s go-anywhere LC and the heritage that comes with it. Unlike Land Cruiser owners who love flying under the radar, the LX570 shouts its prestige from the rooftops. The large Spindle grille and fishhook headlights draw attention while its interior is more techie and plushy than what’s found inside the Yota. Under the hood is the same thing, however. Toyota’s aging 5.7-liter V-8. Here it makes 383 horsepower and 403 pound-feet of torque. It comes mated to a smooth-shifting eight-speed automatic, and full-time 4WD with low range is standard. The Lexus also boasts advanced electronics that aid in off-road driving. 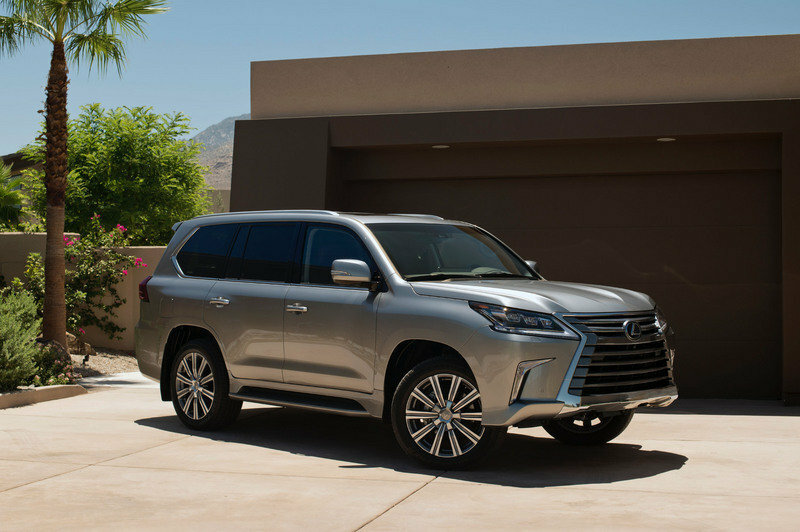 There’s the CRAWL Control and Multi-Terrain Select systems, three drive modes, a locking center differential, and even a turn assist feature that locks the inside rear wheel to shrink the LX’s turn radius while off-road. The adaptive suspension also offers various ride height settings, along with variable stiffness during on-road drives. Pricing is steep with the LX570. The SUV starts at $89,980. There are no trim levels, so the price all depends on how many options and packages are added. Check all the boxes, and the 2018 LX570 will total $98,610. The changes Infiniti has given the 2018 QX80 help it look better, ride better, and offer more luxury to its seven or eight passengers. There’s no denying this mid-cycle refresh is a success. We’re always happy to see improvements. There’s also no doubt Infiniti is hoping the updated help QX80 sales, too. There is certainly room to improve on 15,000 examples sold annually. Then again, Infiniti can be thankful the QX80 far outsells the Lexus LX570’s abysmal figures; only 5,707 were sold in 2016 – and that’s an improvement of nearly 2,000 vehicles over 2015. Ouch. Still, it has a ways to go before catching up to the Escalade’s annual sales. Caddy moved 23,604 in the U.S. in 2016 – and that doesn’t even count the long-wheelbase Escalade ESV. 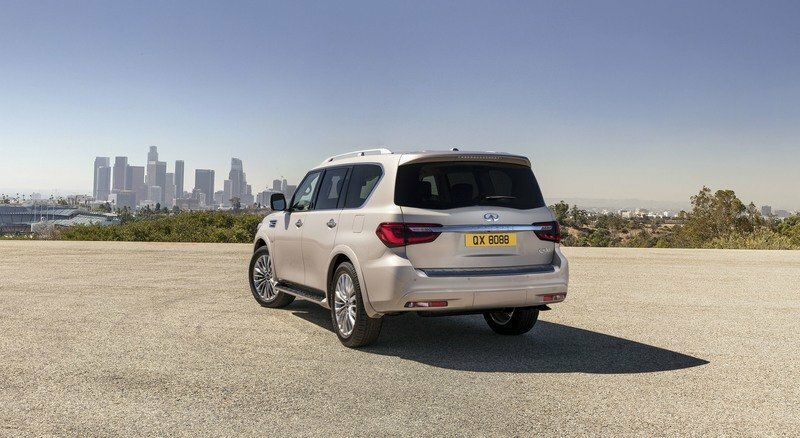 Sales figures aside, the updated 2018 Infiniti QX80 is a solid choice in the exclusive class of luxury body-on-frame three-row SUVs. Read our full review on the previous 2017 Infiniti QX80. INFINITI has today revealed the new QX80 at the 2017 Dubai International Motor Show. Further advancing INFINITI’s presence in the full-size luxury SUV segment, the 2018 QX80 takes INFINITI’s "Powerful Elegance" design language in a bold new direction, creating a powerful, contemporary and commanding aesthetic. The 2018 QX80 stands apart with a refined and spacious cabin that features high-quality materials, a hand-crafted finish, and advanced drive-assist technologies – all combining to promote a sense of inclusive, modern luxury and set new standards for upscale sophistication. With a taut yet comfort-oriented suspension and ample performance from its 5.6-liter V8 engine, the new QX80 gives drivers an assured feeling of control and confidence at the wheel. Production of the new QX80 is underway at INFINITI’s Kyushu production facility in Japan, and it will go on sale in select INFINITI markets across North America, Asia, Western Europe and the Middle East at the end of 2017. "The new INFINITI QX80 has been designed and engineered to allow customers to travel everywhere in luxury. Our flagship SUV features a high-quality, hand-crafted interior, creating a driver-centric, passenger-minded space for inclusive, modern luxury travel." "The INFINITI QX80 has been a popular choice for buyers in the luxury SUV segment, particularly in North America and the Middle East. The new QX80 will boost INFINITI’s presence in the full-size SUV segment by evoking the spirit of inclusive luxury travel. Customers expect maximum comfort, practicality and style – and the 2018 QX80 delivers." The QX80, with its bold design and agile performance, attracts on average the youngest buyers in the full-size SUV segment. Research also shows that the QX80 appeals to a higher percentage of female buyers compared to the competition, with top purchase reasons including spaciousness for five or more passengers, advanced safety features, luxurious look and feel with natural finishes, ample cargo space and a vehicle that is easy to maneuver. The new QX80 provides all this for seven or eight passengers, bringing a confident, modern representation of luxury to the market. Combining supreme space and utility with advanced technologies and high sophistication, the changes to the car’s design – inside and out – more closely align the new model with the most recent INFINITI vehicles through the application of signature design cues. The full-size SUV segment is among the fastest-growing globally, with demand increasing annually. In the U.S., INFINITI has sold more than 14,085 QX80 vehicles calendar year to date, which is an 8.3-percent increase over the same period last year. Additionally, currently accounting for over 50 percent of all full-size luxury car sales globally, the full-size SUV is expected to take an increasingly large share of the high-end market, and INFINITI’s full-size luxury SUV market share is forecast to rise from 2018 onwards. "INFINITI’s design DNA has been scaled up for our largest SUV. The 2018 QX80 combines its commanding new presence with powerful muscularity and enhanced horizontal movement. Our designers raised the visual height of our iconic ’double-arch’ grille and signature headlamps, striking an unrivalled on-road premium tonality." With its muscular lines and generous proportions, the new QX80 sees INFINITI’s ’Powerful Elegance’ design language applied on a new scale. With a forward-looking new appearance, the new QX80 is the ultimate expression of modern luxury SUV design. At 210.2 inches in length, 75.8 inches tall with roof rails, and 79.9 inches wide, the new QX80 has a truly commanding on-road presence. Created by INFINITI’s design studio in Atsugi, Japan, the exterior of the new QX80 incorporates geometric and organic shapes to combine power with elegance. As the largest vehicle INFINITI makes, the new model expresses solidity and power from all angles yet eschews the more aggressive styling espoused by rival SUVs. Despite its scale, the design communicates a clear sense of elegance and human artistry. The smooth, rounded curves of the outgoing model give way to more modern, angular and sculptural forms along with a more upright, athletic stance. The impression is one of greater height and length, despite the car’s footprint and 121.1 inches wheelbase remaining unchanged from the previous model. The new QX80 appears longer, with more clearly defined character lines, and the front appears more purposeful, with large, functional fender vents maximizing air delivery to the engine. A thin strip of aluminum beneath the grille emphasizes width, while the grille itself sits more upright. The leading edge of the hood extends 3.5 inches further forward and sits 0.79 inches higher, creating a more squared-off, vertical front section and a visibly longer, flatter hood when viewed in profile. The lower section of the bumper is raised, elevating the 2018 QX80’s visual center of gravity. The headlamps wrap around the front corners of the hood and into the fenders. As they taper, the lamps lead into a strong, straight shoulder line that runs from the grille all the way to the rear. Paired with upright air vents aft of the front wheel arches, and 0.79-inch wider aluminum sill step running between the axles, these geometric lines convey a muscular, almost architectural statement in profile. Like the rest of the car, the rear exhibits simple, clearly defined details designed to raise the visual center of gravity. With sharper, thinner tail lamps, straight character lines for bodywork and light units, and a raised lower bumper section, the 2018 QX80 appears wider, taller and more athletic than its predecessor. 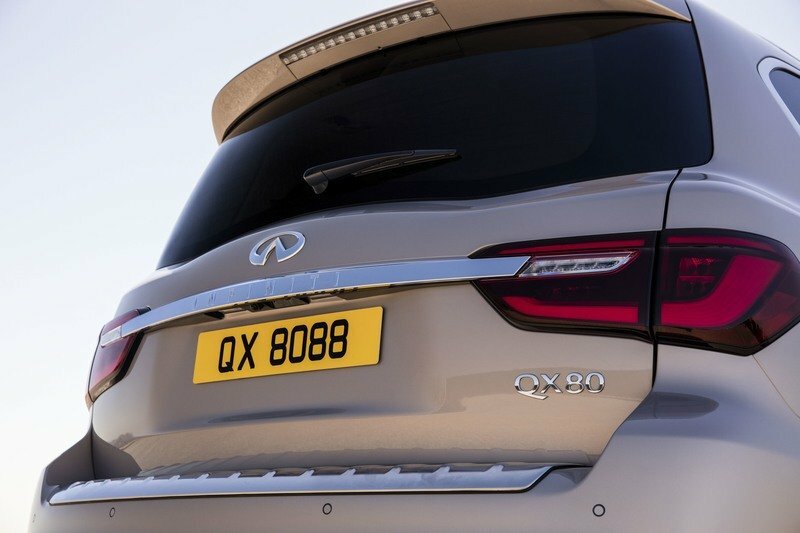 The new QX80 inherits the same unmistakable design elements that run through the brand’s full product portfolio, strengthening the design link with the rest of the INFINITI model range. The new model features the latest incarnation of the brand’s "human-eye" headlamps, which employ triple light guide technology to offer maximum lighting and visibility from every angle. Like a telescope with multiple lenses, a series of reflective channels disperse light evenly throughout the long signature LED eyebrow, and are placed high on the front of the vehicle to accentuate the elevated stance. At the rear the slim, sharp combination tail lamps echo the headlamp shape and employ LED technology. 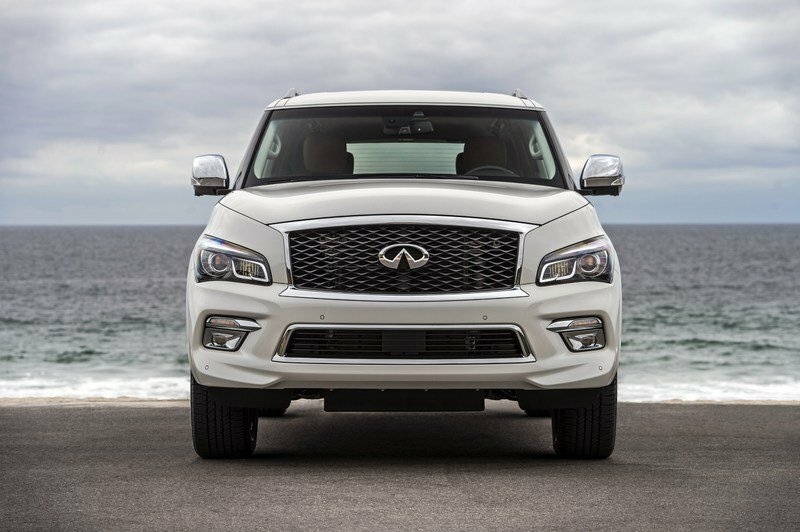 The QX80 boasts a new interpretation of INFINITI’s double-arch grille and, with a larger area to work with, the company’s designers have made the grille taller and wider. Combined with the more upright front aspect, the effect makes the car more visually striking. Another INFINITI signature, the crescent-cut D-pillar lies parallel with the roofline. Like the shoulder line, the elegant design of the D-pillar enhances the horizontal aspect of the 2018 QX80’s upper body. INFINITI has enhanced craftsmanship, sophistication and modernity with a contemporary color palette and new designs for the 20- and 22-inch aluminum alloy wheels. The cast 20-inch alloy wheels feature a new six-spoke design, are finished in dark silver paint and are wrapped in 275/60 R20 H-rated all-season performance tires. The new forged 22-inch wheels are painted in premium liquid metal for a high-gloss finish, the 18-spoke design complemented with lower-profile 275/50 R22 all-season performance tires. The design language of the exterior is accentuated by a revised color palette, offering a range of contemporary finishes. With more visual depth, clearer shine and greater luxury feel, the palette is augmented with three fresh colors – Moonstone White, Mineral Black and Champagne Quartz. Moonstone White is a cool, toned pearlescent white inspired by the clean, bright white of ice found at the Earth’s poles, and reminiscent of fine art and design galleries. Mineral Black is a deep, rich metallic shade with rich copper-gold paint flecks, evoking the trace of a meteorite as it travels through space. Champagne Quartz is inspired by the famed cave walls of France’s Champagne region. It uses aluminum-oxide pigments to give the metallic silver paint a warm gold hue when viewed from one direction, and a cooler silver blue from the opposite direction, varying according to different light conditions. In total, the new QX80 is available with nine solid, metallic and pearlescent paint finishes. In addition to the three new colors, these include three metallic finishes (Liquid Platinum, Smoky Quartz and Graphite Shadow), two pearlescent finishes (Hermosa Blue and Mocha Almond), and solid Black Obsidian. Each color is hand-polished and inspected by INFINITI’s Takumi master craftsmen for maximum depth, shine and luster. "Stepping inside, the cabin changes bring a greater sense of artistry in the treatment of quilted leathers and high-quality, hand-crafted elements, while also offering new technologies. The result is a contemporary, inclusive environment with roots in luxury air travel." The cabin of the new QX80 is one of the most luxurious, highest-quality passenger compartments created by INFINITI to date. Finely tailored and crafted by hand, there is an enhanced human artistry throughout the interior. INFINITI’s designers have created a cabin with a more contemporary execution, both in terms of how it looks and how it feels to the touch. The high-quality tailoring is matched by contrasting colors, new materials for seats and paneling, and more precise attention given to the details. The cabin is finished in a range of rich, new materials, with seats, door panels and armrests wrapped in perforated and quilted leather. Depending on specification, the backs of each seat are also skinned in quilted leather, harmonizing the effect throughout the cabin, with the upholstery sewn together with contrast double-stitching. INFINITI’s interior designers have turned to the milieu of haute couture for inspiration, using leather piping to create sharper, more angular edges to seats and headrests. 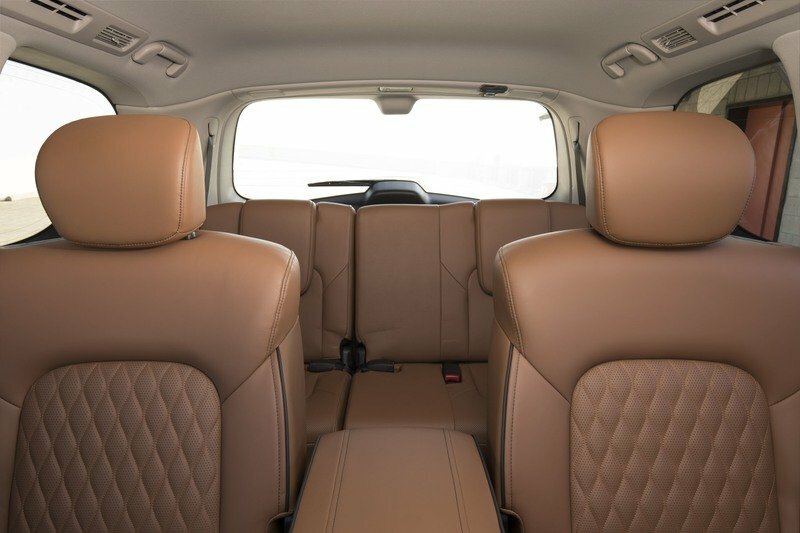 The cabin of the new QX80 can be trimmed in either leather (as standard) or semi-aniline leather with color-contrast piping (optional). 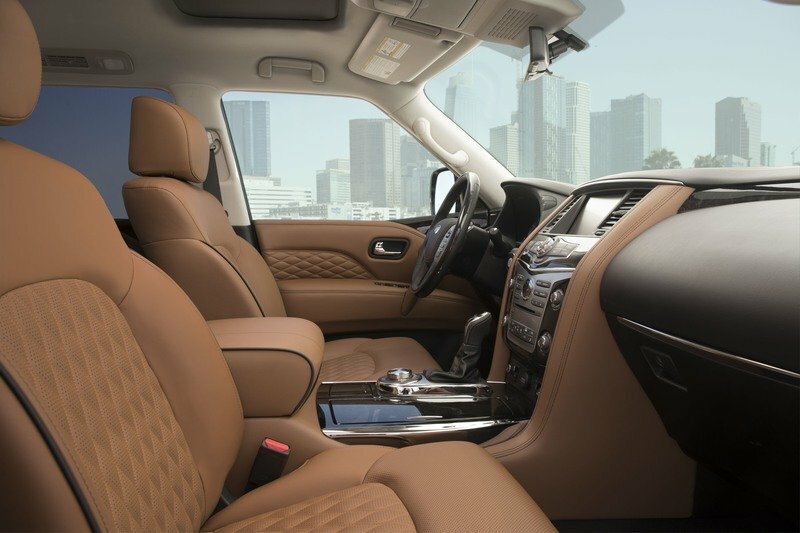 For the latest incarnation of INFINITI’s luxury SUV, the new, premium Saddle Brown leather option is coupled with black contrast stitching and piping. The new model is also offered with Wheat or Graphite upholstery, available in standard leather or premium semi-aniline leather. Wheat semi-aniline leather is finished with dark gray stitching and piping; Graphite models are contrasted with medium gray stitching and piping. Further enhancing the contemporary finish, a variety of interior trims are available. In addition to the standard Stratford Burl gloss wood trim, models with Graphite leather are offered with a dark brown Espresso Burl. With Wheat or Saddle Brown upholstery, an even darker Charcoal Burl trim is available. There is a new leather-wrapped gear shift design with contrast-stitching, and the steering wheel has also been redesigned, again wrapped and trimmed in the same color-contrast leather as the rest of the interior. Higher-density padding makes leather-trimmed surfaces such as the doors and armrest firmer to the touch to provide an even greater sense of robust quality. Designers held a central tenet in mind when designing the interior of the new QX80 – promoting a sense of inclusive luxury. There is an informal, approachable atmosphere, in which all passengers are afforded their own sense of space. A key element in promoting inclusive luxury is cabin refinement, and the 2018 QX80 occupants benefit from a quiet cabin at a highway cruise. A range of soundproofing materials enhance refinement, isolating the cabin from outside noise. A wider soundproofing area behind the dashboard panel reduces engine noise, and denser floor carpets and additional soundproofing materials around the cargo area help to absorb high-frequency noises and vibrations from the road. The result is a 5 percent improvement in the cabin’s articulation index score, which is used to measure the audibility of speech between occupants. The 2018 QX80’s rear entertainment system is also upgraded. Larger, higher-resolution screens provide the interface for connectivity and entertainment devices. The system also now supports 31 languages, up from three in the outgoing QX80. The screens in the backs of the front seats have been updated from 7.0 to 8.0 inches, offering a higher 960 x 540-pixel resolution (up from 800 x 480). Furthermore, the 16:9-ratio screens (a similar ratio to high-end smartphones and to those required by portable gaming systems) support super-resolution imaging, and Ultra Resolution Technology. The latter enables the screens to convert content into a sharper high-definition picture. More connected than previously, the second-row rear-seat entertainment system now supports input from the new HDMI auxiliary port, in addition to a media USB port. This enables the system to draw upon a wider variety of sources, including portable Blu-ray and DVD players, game consoles, smartphones, tablets, USB memory sticks and video cameras. Both screens are controlled via remote control. Two further USB ports have added to the rear of the cabin to charge mobile devices. Where the outgoing QX80 offered wireless headphone support, the new model adds to this headphone jacks for two rear passengers to listen via wired headphones. Each screen can now display individual content – as opposed to both rear screens sharing the same input – meaning second-row passengers can choose what they play or watch independently. Passengers in the front also get more comprehensive control of the entertainment system. Front-row passengers can use the Remote Control Lock function – accessed through the dashboard or steering wheel – to lock the rear-seat remote control. In addition, front-seat occupants can turn displays on or off, switch between different inputs remotely, select which audio sources are used, and play or pause content. A new "All Mute" button also enables the driver or front passenger to mute every audio source in the cabin, including headphones. INFINITI’s InTouch infotainment system has been updated, allowing drivers to personalize driving characteristics and the cabin environment. Adjusted via the 8.0-inch touchscreen, the intuitive system is controlled with multi-touch smartphone controls and voice control, as well as physical buttons beneath the screen and on the steering wheel. The revised layout of dashboard buttons, and customizability of apps and icons on the touchscreen, make the new QX80’s InTouch system easier to use than ever before. Updates to the navigation system include extended map coverage of countries across Eastern Europe, the Middle East, Latin America and Asia Pacific. The system now also features voice recognition and voice navigation in Arabic. Paired with the 2018 QX80’s smart key, INFINITI’s InTouch system memorizes more than 200 settings for two drivers, including customized settings for navigation, seat positions, audio, safety systems, climate control presets and configuration of the infotainment system. The car automatically adjusts when it detects each smart key. The system offers full smartphone connectivity and telematics support, depending on market. This enables owners to control elements of the car remotely, and access a range of other support functions. New features include Remote Engine Start, enabling drivers to start the engine and heat or cool the cabin before getting in; and Remote Horn and Lights, enabling drivers to control the car’s horn and lights via their phone – useful if the driver is unable to remember their car’s location in an airport parking lot. Other connectivity and telematics features include breakdown calls; stolen vehicle tracking and theft notifications; curfew alerts; maintenance alerts and vehicle health reports; and route planning with Google Send to Car and operator-assisted destination settings. Changes to the interior of the 2018 QX80 go beyond aesthetics, material choices, and new technology. INFINITI enhanced the utility and packaging of the cabin, aligning the new QX80 more closely with the needs of customers. Improvements to storage space and ergonomics give occupants more storage spaces. In the front, the center console now features a larger smartphone storage area, able to accommodate mobile devices up to 2.9 inches in width, such as the iPhone X, iPhone 8, and Samsung Galaxy S8. The twin cup holders in the front have been reshaped to accommodate two 44oz cups with handles (previously, the QX80’s cup holders could hold one 44oz mug with a handle and a 32oz container). The USB port has also been relocated to the opposite side of the center console, making it easier to access. The storage area beneath the front passenger armrest has been expanded, with the underside of the lid reshaped to create a 5.4-liter compartment. At 9.4 inches in height, the compartment can now hold up to three upright 1.0-liter bottles. The space is shaped to accommodate tablet devices such as the iPad Air, iPad Air 2 and Samsung Galaxy Tab S3, stood vertically. All doors feature storage areas for bottles and other items, with the second-row center console on certain models providing further spaces to hold mobile devices and other valuables. For buyers with an eye for cleanliness, such as parents who may want their car to better stand up to the rigors of family life, the new QX80’s upholstery features a new soil-resistant coating. The new hydrophilic coating is applied to the seats, door trim, center console, instrument panel and rear armrest, and it protects surfaces from denim dye transfer, staining and spills. The micro-coating means surfaces can be easily wiped clean with a damp cloth. There is generous space for front and rear occupants. In the front, passengers enjoy legroom and headroom of up to 39.6 and 39.9 inches, respectively. For second-row passengers, legroom and headroom stands at 41.0 and 40.0 inches, while third-row passengers get 28.8 and 36.8 inches leg and headroom. It is now easier to get in and out of the 2018 QX80 – the sill step is 0.79 inches wider than the earlier model, providing more foot space for ingress and egress. Cargo capacity remains high, with 49.6 cu ft when the third row of seats is folded down. This provides sufficient space to store four large suitcases, four golf bags, or a baby-stroller stored lengthways, without impairing rear visibility for the driver. With all three rows of seats in place, the trunk offers 16.6 cu ft of storage capacity, enough to store a pair of full-sized suitcases upright. "The new QX80 offers drivers greater levels of confidence at the wheel, with a suite of drive-assist technologies that empower the driver. Despite the car’s size, the 2018 QX80 is easy to drive with full confidence." The new QX80 offers a range of drive assist technologies – proactive safety innovations that support the driver in identifying and responding to other vehicles and potential hazards. Drawing on inputs from five cameras and three radars to read the road ahead and monitor the vehicle’s surroundings, the system allows the car to react accordingly. The 2018 QX80 is available with a range of technologies to inform the driver of their surroundings, help them avoid potential hazards and ease the monotony of driving in certain conditions. These technologies include: Lane Departure Warning and Prevention, Intelligent Cruise Control, Distance Control Assist, Predictive Forward Collision Warning, Forward Emergency Braking, Blind Spot Warning and Intervention and Backup Collision Intervention. The drive assist technologies can operate between 20 and 90 mph, while Intelligent Cruise Control can operate down to just 1 mph. INFINITI has long been a pioneer in changing public perception of active and protective safety technologies. The brand led the way with a range of world-first applications of proactive safety innovations, including Backup Collision Intervention, Lane Departure Warning and Prevention, and Predictive Forward Collision Warning. Owners of the new QX80 are further assisted by an available new Smart Rear View Mirror. The new ’digital’ mirror allows the driver to use the rear-view mirror as a standard mirror, or turn it into a monitor at the touch of a button. In the latter mode, it displays video from a camera mounted in the upper rear windshield. This enables drivers to see behind the car even when the rear window is blocked by fog, ice, passengers, or cargo. In icy conditions, owners need only scrape ice off the camera lens, instead of the entire rear window. Furthermore, it improves visibility at night and in low-light conditions, with a High Definition Resolution (HDR) display combining two images into one, like a smartphone camera, at 60 frames-per-second. As a safety measure, it also enables a clearer view behind the car in all conditions, with a wide-angle lens providing full visibility to the rear. Compared to a conventional rear-view mirror, with a 19 to 20-degree viewing angle through the car and out of the rear glass, the 2018 QX80’s new Smart Rear View Mirror offers up to a 48.1-degree view. The new QX80 offers a taut yet comfort-oriented ride, with the suspension engineered to filter out poor road conditions and keep occupants comfortable. Whether at cruising speeds, on busy urban roads, or on a winding highway, the 2018 QX80 remains composed and controlled at all times. The new QX80 assures a calm, refined ride for all occupants and is focused, first and foremost, on comfort. Despite the comfort-biased brief for the fully-independent double-wishbone suspension, the 2018 QX80’s unique available Hydraulic Body Motion Control (HBMC) technology limits excess body-roll under more severe cornering. HBMC monitors body lean and roll as the 2018 QX80 turns into a corner, and adjusts the suspension to create a smooth, flat ride. Hydraulic cylinders are connected to the shock absorber, and linked to one another with high-pressure hydraulic channels. Two accumulators monitor body roll and adjust suspension stiffness on each side of the car by transferring oil between the hydraulic cylinders. As the car corners and the body starts to lean, HBMC firms up the suspension on one side of the car to counter this effect. When equipped with HBMC, the 2018 QX80’s lean angle is around 35 percent flatter than that of the segment bestseller, without sacrificing the cruising comfort expected of a luxury SUV. For the new model, the suspension’s damping force also has been reduced by 30 percent at every corner, isolating the cabin further by absorbing higher-frequency vibrations. This has been achieved by retuning the characteristics of the 2018 QX80’s shock absorber pistons. Rear Auto-Leveling Suspension automatically adjusts suspension pressure to maintain the optimum ride height with cargo in the trunk or a trailer on tow. This allows the 2018 QX80 to tow up to 8,500 lbs, and carry up to 95.1 cu ft of interior cargo volume with third- and second-row seats folded. By keeping the vehicle at its optimal height, the 2018 QX80 remains stable and continues to offer responsible handling and braking, improving driver confidence when towing or carrying heavier loads. Gathering feedback from existing QX80 customers, INFINITI has also changed the vertical angle of the radial steel belt in the tire walls. This reduces vertical deflection by 5 percent over the outgoing QX80, enabling the car to better absorb small vibrations and road impacts when driving over rough or broken surfaces. Finally, the design changes to the car are accompanied by optimized aerodynamic properties. With a drag co-efficient of 0.36 Cd – competitive with the most aerodynamic designs in the segment – the new QX80 features a range of modifications to better direct air over, around and under the vehicle. INFINITI has applied its zero-lift approach, maximizing stability at higher speeds. Revisions to the car include a new under-body cover, reshaped to improve air flow, reduce air pressure beneath the body and better direct air away from the rear tires to reduce drag. The redesigned body also enhances air flow, particularly off the rear, to minimize drag-inducing turbulence. These changes reduce the effects of wind turbulence at higher speeds, leaving the driver feeling more in-control and connected with the road. In partnership with the advanced suspension, the 2018 QX80’s powertrain ensures effortless and refined progress. With a powerful 5.6-liter V8 engine driving the rear or both axles, the new QX80 remains the consummate performer in even the worst driving conditions. 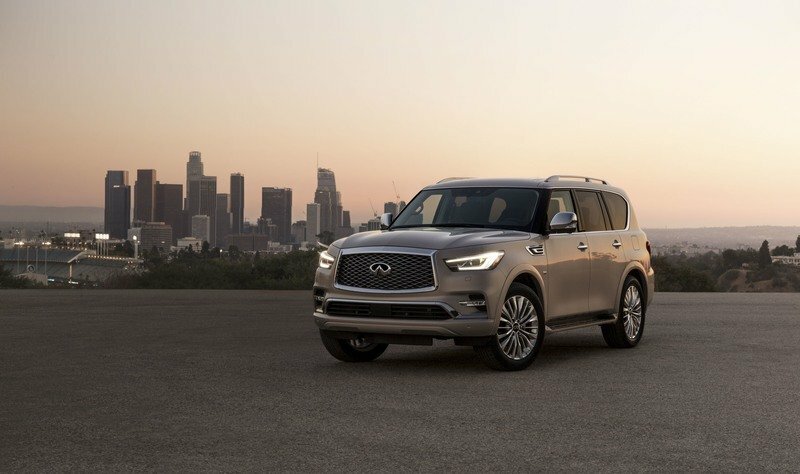 The 2018 QX80 is available with two-wheel drive or INFINITI All-Mode 4WD, the latter enabling four-wheel traction when conditions require it, and off-road capability when the driver demands it. With optimal all-season power delivery, the rear-biased drivetrain defaults to rear-wheel drive, continually adjusting power distribution between front and rear axles. Drivers can customize the four-wheel drive system via a dial in the center console. The system sits in ’auto’ mode by default, using a computer-controlled transfer case to instantly redistribute engine torque to the wheels with the most traction. Permanent high- and low-range four-wheel drive settings are also available. The high-range setting is designed to take on moderate off-road driving and snow; the low-range function empowers drivers to tackle more demanding off-road conditions, with steeper inclines and declines, when more traction is needed. The four-wheel drive system is backed up by the 2018 QX80’s four-wheel Active Brake Limited Slip (ABLS) system, which responds to wheel-spin by automatically applying brakes to each spinning wheel, and redistributing torque to other wheels to maximize traction and control. Both two- and four-wheel drivetrains are paired with an advanced 5.6-liter DOHC V8 engine, delivering ample on-road performance. 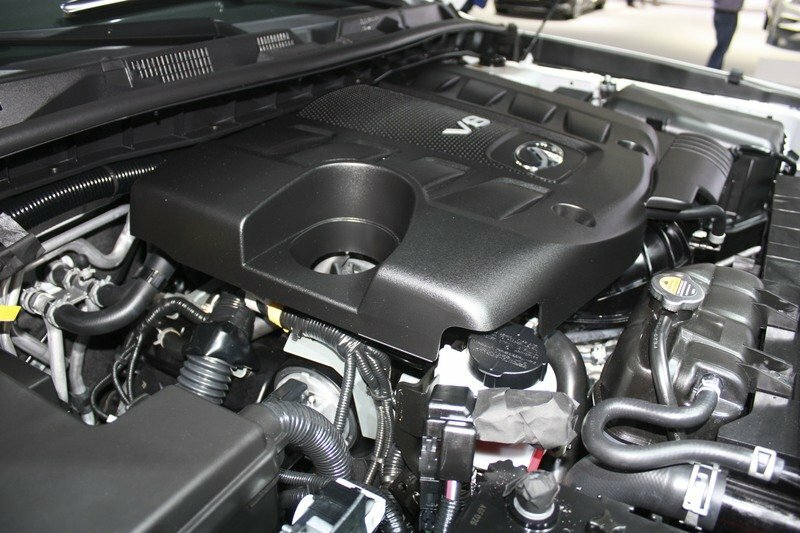 Combining the combustion efficiency of Direct Injection Gasoline, and the responsive acceleration of VVEL (Variable Valve Event and Lift) technology, the V8 engine produces 400 hp (298 kW) and 413 lb ft of torque. The smooth-shifting seven-speed automatic transmission, fitted as standard to every model, allows the driver to access the engine’s power and torque reserves at any time. The automatic transmission features Adaptive Shift Control, and manual shift mode with Downshift Rev Matching. In two-wheel drive configuration, the 2018 QX80’s fuel economy is rated at 14 mpg city, 20 mpg highway and 16 mpg combined. Four-wheel drive variants are capable of 13 mpg city, 19 mpg highway and 15 mpg combined.